When a billionaire’s only son weds, you know it’ll be big and one-of-a-kind. It was the most anticipated wedding, especially in the society and luxury media circles, and all the stops were pulled out for a magnificent celebration. Real estate tycoon Asok Kumar Hiranandani, who has an estimated net worth of US$1.24B, and his wife Asha feted the marriage of their son Bobby Hiranandani to Shaila Tanwani over a five-day celebration attended by guests from all over the world. Indeed, owning the venue meant the couple had the freedom to create a truly bespoke event. 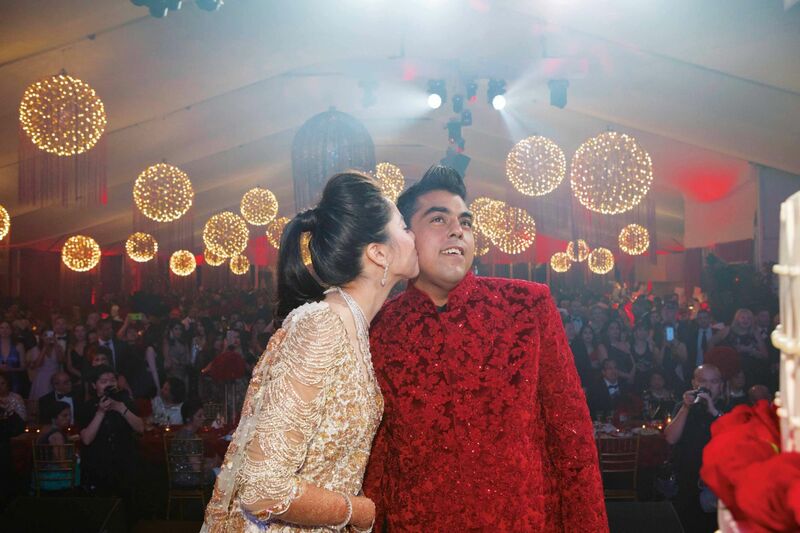 The celebration was a harmonious marriage of Indian traditions and modern touches. Kicking off the festivities was the mehendi or henna party on December 6, a vibrant evening soiree underscored by brilliant colours and a mystical Moroccan feel complete with belly dancers. The momentum continued to build at the next day’s sangeet, a princely affair where guests dressed to the Maharajah and Maharani theme. To balance the expected sea of colours guests would wear, a mostly-white design palette was chosen for this event. The ceremonial sound of bagpipes playing signalled the arrival of the couple. The highlight was a performance by the couple, their family and friends. Bollywood singers Vishal & Shekhar also entertained. The Navghari and Ghari Pooja were kept intimate and traditional, as was the wedding ceremony at Gurdwara Katong. Then on the final day of celebrations, fantasy and drama took centre stage in a Moulin Rouge-styled reception. Thousands of fresh red roses, as well as feathers and sequins scattered all over the marquee imparted a romantic Parisian feel, while red and black elements lent drama and energy, getting guests in the mood for all-night dancing, what with Bollywood singers Salim-Sulaiman providing entertainment. “We were very hands-on with the planning, especially Bobby who attended all meetings with our wedding planners, organisers, designers and even our suppliers. He took care of every detail of the wedding and made sure that it was very special and memorable to both of us. It was just so perfect. It might have been very tiring but everything was worth it. We enjoyed every single day of the celebration and I can only describe it as magnificent!” says the bride. Singapore Tatler Weddings looks at some of the key people who journeyed with the couple to their big day. Assigned as overall collaborator, Bobby’s sister effortlessly moved between coordinating family meals, travelling overseas with Shaila for her gowns, and personally calling guests. At the wedding, she constantly flitted around the couple to make sure everything was in order, right down to touching up the bride’s lipstick. “I wanted to support Shaila and Bobby all the way, from the wedding preparation to the actual celebration and for the rest of their married life,” she says. Bride and groom were dressed by the Indian couturier, who has designed for numerous Bollywood first ladies including Madhuri Dixit and Aishwarya Rai Bachchan. They had seven outfits each, each one a showstopper and a testimony of the designer’s love for intricate details. For the sangeet, Shaila wore a blue dress heavily embellished with crystals while Bobby was in a gold traditional outfit. At the ceremony, he was in another gold number while she was in a red-and-gold creation accentuated with an intricate headpiece. Dimple and Asha were also dressed by the designer. During the celebration, there was a surprise birthday cake to commemorate the designer’s 50th birthday. From Indian and Chinese to French and Japanese, there was excellent food to keep this celebration going. The cluster executive chef at Sofitel Sentosa Singapore Resort & Spa shares that there were 12 different menus for the six wedding events, with dishes specially requested by the couple, such as mee goreng, fried carrot cake, quesadilla, Sindhi curry and aburi sushi. “More than 80 chefs were mobilised for the entire wedding, with 12 stewards and 40 part-timers to help with food preparations,” he says. They were greeted with garlands, cold towels and a welcome drink and champagne, which was accompanied by live traditional music fanfare. A hospitality desk and dedicated desk for transport was also set up throughout the events, and butler services were extended. Bobby’s guests were assigned in one wing and Shaila’s guests in another. Each wing was sub-divided for different family groups. Rooms were blocked days before the event for early preparation by the housekeeping, engineering and front office teams. Of course, extra care was taken with the bridal suite, which the team specially decorated with flowers for a romantic feel. OMO Events was asked to plan their wedding. Building the air-conditioned marquee on the resort lawn took a month. It was used for two of the biggest events, accommodating 2,000 guests with stage, dance floor, buffet counters and seating.